But choosing between various types of routers can be a challenge. 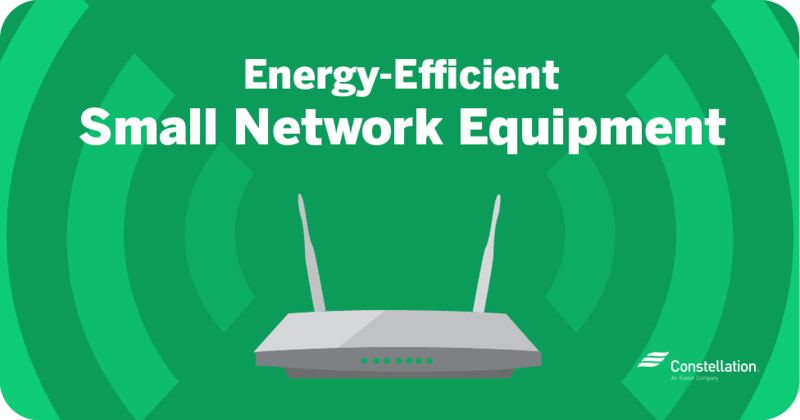 Here’s what you need to know about types of routers and other small network equipment choices that can boost your office’s energy efficiency and even improve business security. What Is Energy-Efficient Small Network Equipment? Energy-efficient network equipment describes routers, modems and other equipment that conserve power when not in use. According to the California Energy Commission, this term includes all network equipment designed for wireless connectivity. What are the benefits of energy-efficient small network equipment? Small network equipment tends to be on all the time, idling and consuming power even when not in use. This means devices consume the same amount of energy whether they are active or not, and this represents a growing demand on energy resources. By 2020, a staggering 50 billion network-enabled devices will exist worldwide, and the International Energy Agency estimates that by 2025, these networks will consume a staggering 1,140 terawatt hours a year—an amount greater than the current energy consumptions of Canada and Germany combined. 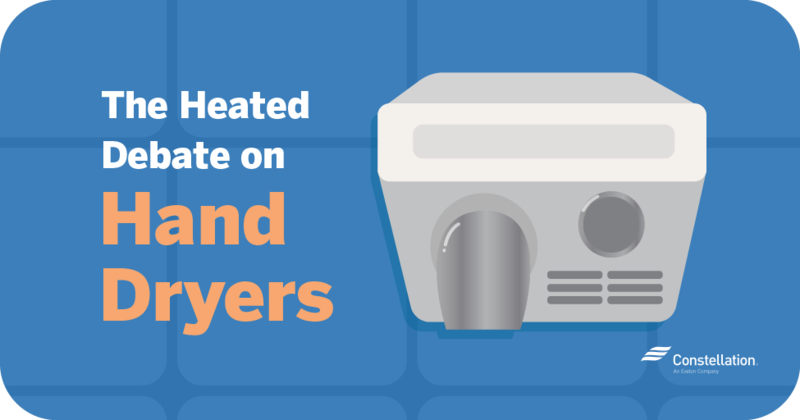 This means knowing how many watts a router uses can make an impact on your total energy usage. How can energy-efficient small network equipment save energy? Business owners can save energy on Wi-Fi with routers and modems that automatically power down when the equipment is not in use. Low-power mode is a setting on energy-efficient routers and modems that sets the device to standby or sleep mode when it’s not actively working. 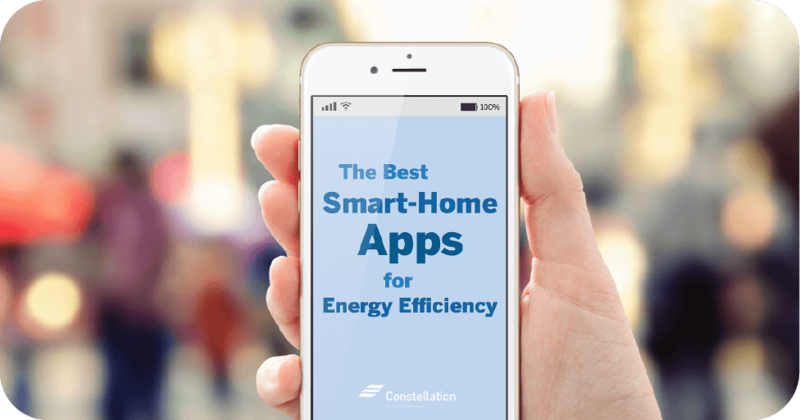 A report by California Energy Commission estimates most devices should spend 80 percent of their time in LPM to reduce energy consumption. Energy-efficient Ethernet (EEE) is an IEEE standard developed to scale network power consumption up or down depending on usage. ENERGY STAR®–rated routers adhere to IEEE standards, making them desirable small business technology upgrades. How Does Energy-Efficient Small Network Equipment Work? A network is a group of computers, printers and other equipment connected either wirelessly or via cable. The network can be used to share files and printers, communicate, gather and protect data, and provide remote access to users (such as employees working from home). Most businesses now use networks of some kind, even if the network isn’t fully understood by its users, and selecting the right kind of equipment can alter a business’s energy usage. When choosing a network for your business, it’s important to compare the following. A business network may be either an LAN or a WAN. As the name suggests, a LAN is a local network, confined to a small area and usually managed in-house. WANs cover a large geographic area, such as a college campus or town. The Internet itself is an example of a WAN. 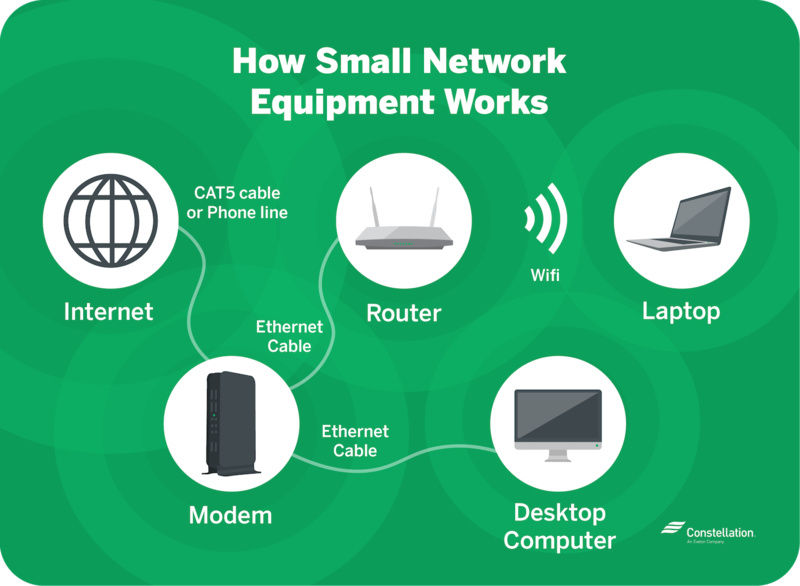 Most small business networks are LANs, which allow higher data transfer rates than WANs and can connect to other LANs either wirelessly or through telephone lines or cable lines. Before discussing the relative merits of wired versus wireless Internet access, it’s important to define the difference between Wi-Fi and Ethernet networks. Wi-Fi is a wireless technology that connects devices to a network through radio signals. Ethernet connects devices to the router through cables. When it comes to Wi-Fi versus Ethernet, the main considerations are speed, convenience and security. Ethernet was once the faster choice, but with the release of the 802.11g Wi-Fi standard, Wi-Fi can now be as fast or even faster than wired networks. In terms of business security, Ethernet is the safer choice. Wi-Fi is an open network, and when comparing wired versus wireless Internet, any data that is not encrypted could conceivably be intercepted while being transferred across the network. A broadband modem communicates with a business’s Internet service provider (ISP), linking the business’s LAN to the wider Internet. Without a modem, the LAN would have no way to transmit and receive data outside of the local network. When looking for a modem, look for a modem with low-power mode to save on your energy usage. A router is a device that allows multiple computers to communicate on the same network by optimizing network traffic and coordinating IP addresses. When connected to a modem (which may or may not be built in, depending on the type of router), the router provides Internet access to all computers on the network. When looking for a router, look for a router with low-power mode to save on your energy usage. Knowing how many watts your router uses can also help you factor in if a router with LPM works for your business. Wired routers. A wired router is hardwired to all computers in the network and is often the router of choice for businesses if compatible wiring exists in the office. Wired routers offer more robust security as data is contained within the network. Wireless routers. 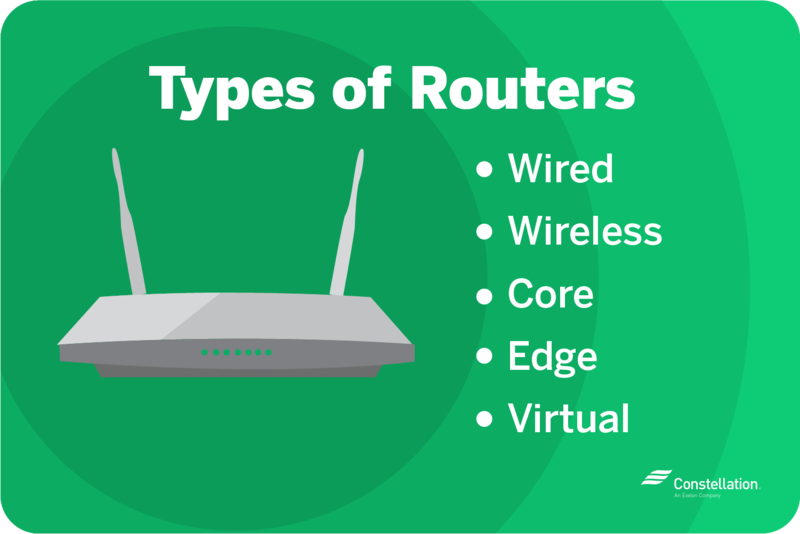 The difference between wired and wireless routers is simple and right there in the name—wired routers use wires, and wireless ones don’t. Wireless routers are commonly used when computers and printers are installed in areas without an existing wired infrastructure. Wireless routers are also more convenient, in that any device with the network name and password can quickly access the network. This openness, however, can make data more vulnerable. Core routers. A core router forwards data packets within a business network, but not between other networks. This allows for business owners to connect multiple devices in your network to just one router. Edge routers. Edge routers are specialized routers at the boundary of a network. The edge router uses an external border gateway protocol or eBGP to connect to external networks or systems. Virtual routers. A virtual router is a piece of software that mimics the Internet protocol routing usually performed by a hardware-based router, allowing routing functions to be moved freely across the network. Pro tip! Border gateway protocol (BGP) is the primary protocol behind all Internet connectivity. It routes data transfers between (or sometimes within) autonomous systems. When the connection is happening between distinct systems, the connection is known as an eBGP. Broadband refers to any high-speed Internet access. Broadband-access equipment describes any equipment that facilitates such access, and that includes modems, integrated access devices (IADs) and optical network termination devices (ONTs). For these devices, be sure to look for LPM capabilities or EEE connectivity to save energy and make the most of your broadband-access equipment. For businesses that rely on data speed for success, an ONT may be more appropriate than a regular modem or IAD. An ONT converts fiber-optic connections to wired or wireless connections for much high data-transfer speeds. Local network equipment includes those devices needed to create an LAN and transmit data within that network. Such devices include routers, switches, hubs and access points. For these devices, be sure to look for LPM capabilities or EEE connectivity to save energy and make the most of your local network equipment. Switches are devices used to extend a network’s range while increasing the number of devices capable of connecting over a single network. Access points, or range extenders, extend the range of a wireless signal. Access points are highly useful in workspaces where distance weakens wireless signals—a classic example would be a multistory building where the main router’s range does not cover all floors. Hubs link computers and smart devices on the same network, allowing users to control smart bulbs, appliances, smart locks and other interactive devices. Hubs are increasingly popular elements of small business technology, in part because they allow business users to remotely control energy use and security. An external network proxy allows network devices such as printers and computers to enter sleep mode without losing network connectivity. The proxy reviews any data or message sent to the network and decides whether to wake up the appropriate device to deal with the incoming information. As a result, network devices can reduce their energy consumption without disconnecting from the network. Here are some answers to the most common questions people ask about network equipment. What is the difference between wired versus wireless routers? As noted above, the difference between wired and wireless routers is more than simply whether the network system is wired. Wi-Fi versus Ethernet arguments center on reliability and security. Comparing cable modems versus wireless routers shows that the wireless modem offers more consistent and reliable data speed, but wired networks are by their nature more secure than Wi-Fi. Wireless routers allow for more versatile network setups, as computers can connect to the network even in areas lacking wired access. Most wireless routers transmit only on a single radio band—either 5 GHz or 2.4 GHz. Dual routers operate on both signal bands simultaneously for more reliable transmission and stronger signal strength (which means faster Internet). Dual-band routers can connect to smartphones, computers and other network devices. How many watts does a router use? Wi-Fi router wattage varies considerably. Routers use an average of 6 watts with some using as few as 2 watts and others using as much as 20. Any router using 6 or more watts should not be considered energy efficient. To determine the energy consumption of your own router, use Energy.gov’s appliance energy calculator. To save energy on Wi-Fi routers, consider switching to ENERGY STAR®–rated routers, which consume 20 percent less energy than less efficient models. Should I turn off my router overnight to save energy? If you are concerned with wired or Wi-Fi router wattage, you can save power by turning off a router when it’s not in use, such as on evenings, weekends or holidays. 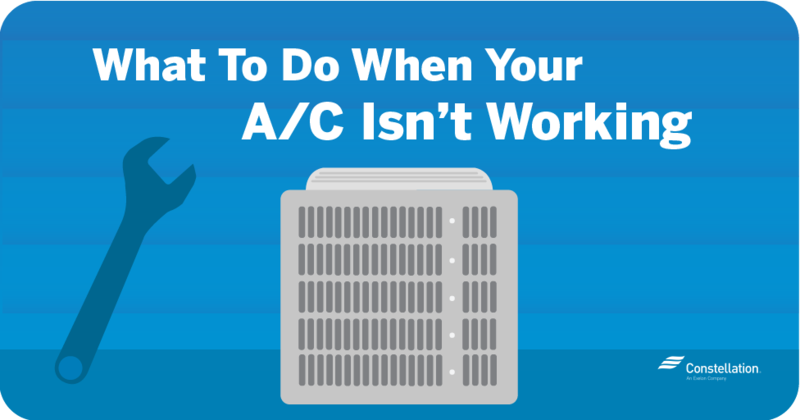 However, while this is an efficient energy-saving solution, turning off routers is not recommended if your business relies on Internet-connected services. Turning off the router, for instance, would prevent business owners from accessing smart security systems connected to the network. Replacing existing routers with ENERGY STAR®–rated routers is a more practical means of controlling Wi-Fi router wattage. How long does a router last? Estimating the lifespan of a router is difficult, but many can provide service for up to 10 years. Just because a router can last 10 years, however, does not mean you can’t replace it sooner. Advances in energy efficiency, security and connectivity may make it necessary or advisable to retire a router before the end of its service life. A business’s data and ability to access information are increasingly important in today’s online world. Choosing the right network equipment for your business and the right router from among the various types of routers available will help you stay competitive while also reducing your workplace energy consumption.